In thirty-nine days I will be turning 38. Over the weekend, I mentioned how fun it would be to receive 38 books for my classroom library in honor of turning 38. I shared my Amazon Wishlist and yesterday, two books showed up. You guys know just how to make me smile. So why not go for it, right? Let’s add 38 books to my classroom library! All you have to do is go to my Wish List on Amazon. Many, many books my students put on there are less than $10 each. 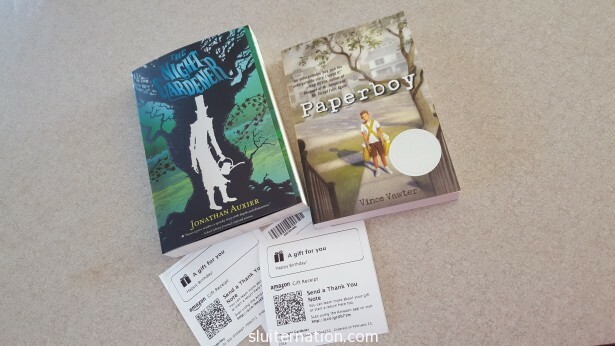 (Did you know most of the books are requests directly from my students? They are! Some are also added by me because I know my students will love them). It’s a LONG list. If you purchase one off the list, it will get sent directly to me! You may choose to donate anonymously, or you can leave us a message to tell us where it came from. I will be posting pictures here on my 38th birthday on March 27. I just realized that this kind of party–a book party–has GOT to be the best birthday party EVER. Plus it’s the kind I can share with my students! Speaking of my students, did you know I post over at The Educator’s Room regularly? Check out my posts about why Reading Logs have to go and how I use Reader’s Notebooks with my middle school students. I also have a post on Writers Who Care about my writing process and how procrastination is a very large, important part of it. By the way, thanks for being awesome.